This kit includes everything you'll need to create your own charming terrarium. 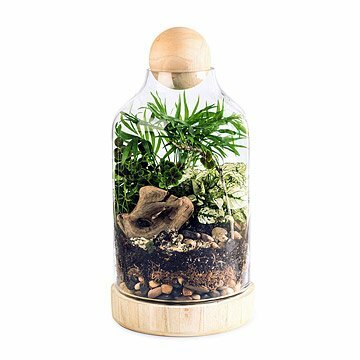 Designed by terrarium artists Michelle Inciarrano and Katy Maslow, this kit includes everything you'll need to create your own thriving, self-contained world from the ground up. From the hardy terrarium plant seeds to the proprietary soil mix, each aspect of this DIY conservatory was coordinated through the conjunction of art, science and design to help the timid terrarium-maker or bad news botanist. The handsome glass and wood vessel includes detailed instructions, packets of all the necessary terrarium layers, and embellishments such as black lichen, reindeer moss, lichen branch, and a couple of cute bunnies for extra luck. You'll be the architect of your own verdant tabletop realm in no time! Handmade in Brooklyn. 14" H x 6.5 Dia; 4lbs. Keep out of direct sunlight and water sparingly. Detailed instructions included. Bought as a gift...I would love one now!! This ended up being a great gift. My father really enjoyed putting it together. Now he is holding his breath worrying he overwater it. This isn't the fault of the product, he just can't help himself! The product itself is fine - or would be, if all of the pieces and parts were shipped with it. It is advertised as coming with "a couple of cute bunnies for extra luck." These small, decorative items were not included in the package - and neither an online chat nor a phone call with Uncommon Goods customer-service representatives has succeeded in getting the missing items sent to me, nearly two weeks later. Since the terrarium kit was a gift for a child, this seemingly small oversight is more significant than it would have been otherwise. Easy, fun, and attractive. The directions said that bunnies are included, but mine came with mushrooms. They're cute too so it doesn't matter, but the directions didn't match what actually came with the product (in case anyone else is searching the box for bunnies). :) I had fun putting this together and now I'm just waiting patiently to see what pops up from the bulb and seeds! This will be used in home decor. It was a gift for my son's girlfriend who loves to do a bit of gardening in her apartment. Instructions could have been more clear but it doesn't take a rocket scientist to figure it out...the biggest beef is the much touted bunnies weren't included, only two cows.